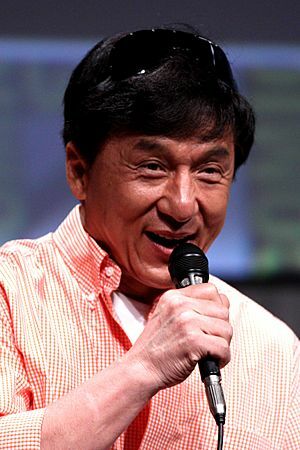 Chan Kong-sang, SBS, MBE, PMW born 7 April 1954, known professionally as Jackie Chan, is a Chinese-Hong Kong martial artist, actor, film director, producer, stuntman, and singer. He is known for his acrobatic fighting style, comic timing, use of improvised weapons, and innovative stunts, which he typically performs himself, in the cinematic world. 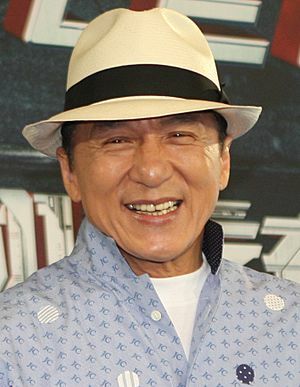 He has trained in Kung Fu and Hapkido, and has been acting since the 1960s, appearing in over 150 films. 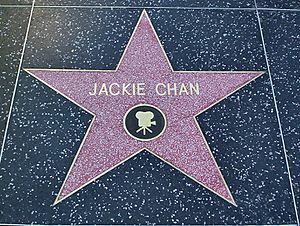 Chan is one of the most recognizable and influential cinematic personalities in the world, gaining a widespread following in both the Eastern and Western hemisphere, and has received stars on the Hong Kong Avenue of Stars, and the Hollywood Walk of Fame. He has been referenced in various pop songs, cartoons, and video games. He is an operatically trained vocalist and is also a Cantopop and Mandopop star, having released a number of albums and sung many of the theme songs for the films in which he has starred. He is also a globally known philanthropist, and has been named as one of the top 10 most charitable celebrities by Forbes. In 2015, Forbes magazine estimated his net worth to be $350 million, and as of 2016, he was the second highest paid actor in the world. Chan was born on 7 April 1954, in Hong Kong, as Chan Kong-sang, to Charles and Lee-Lee Chan, refugees from the Chinese Civil War. His mother or parents nicknamed him Pao-pao Chinese: 炮炮 ("Cannonball") because the energetic child was always rolling around. His parents worked for the French ambassador in Hong Kong, and Chan spent his formative years within the grounds of the consul's residence in the Victoria Peak district. Chan attended the Nah-Hwa Primary School on Hong Kong Island, after that he attended the China Drama Academy, a Peking Opera School run by Master Yu Jim-yuen. Chan trained rigorously for the next decade, excelling in martial arts and acrobatics. 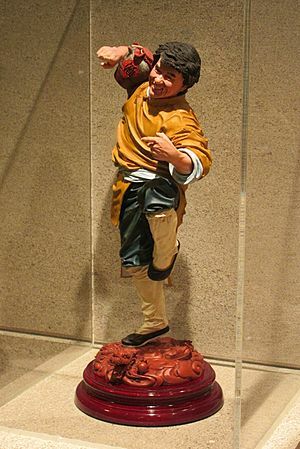 He eventually became part of the Seven Little Fortunes, a performance group made up of the school's best students, gaining the stage name Yuen Lo in homage to his master. Chan became close friends with fellow group members Sammo Hung and Yuen Biao, and the three of them later became known as the Three Brothers or Three Dragons. After entering the film industry, Chan along with Sammo Hung got the opportunity to train in hapkido under the grand master Jin Pal Kim, and Chan eventually attained a black belt. 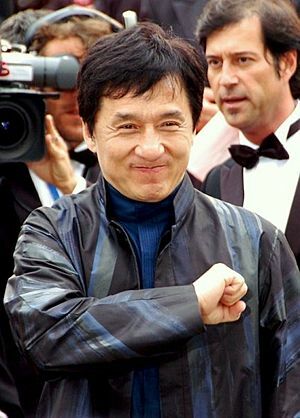 Jackie Chan also trained in other styles of martial arts such as Karate, Judo, Taekwondo and Jeet Kune Do. Chan is an avid football fan and supports the Hong Kong national football team, England National Football Team, and Manchester City. He began his career by appearing in small roles at the age of five as a child actor. At age eight, he appeared with some of his fellow "Little Fortunes" in the film Big and Little Wong Tin Bar. Chan's first major breakthrough was the 1978 film Snake in the Eagle's Shadow. Director Yuen Woo-ping allowed Chan complete freedom over his stunt work. The film established the comedic kung fu genre, and proved refreshing to the Hong Kong audience. Chan then starred in Drunken Master, which finally propelled him to mainstream success. 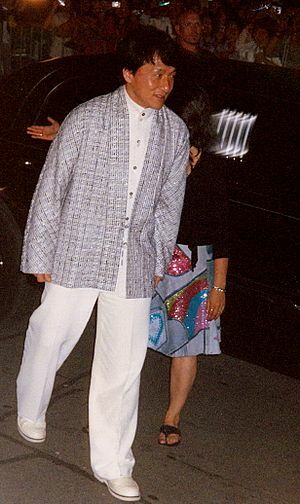 Chan produced a number of action comedy films with his opera school friends Sammo Hung and Yuen Biao. The three co-starred together for the first time in 1983 in Project A, which introduced a dangerous stunt-driven style of martial arts that won it the Best Action Design Award at the third annual Hong Kong Film Awards. In 1985, Chan made the first Police Story film, a US-influenced action comedy in which Chan performed a number of dangerous stunts. It was named the "Best Film" at the 1986 Hong Kong Film Awards. In 1986, Chan played "Asian Hawk," an Indiana Jones-esque character, in the film Armour of God. The film was Chan's biggest domestic box office success up to that point, grossing over HK$35 million. Chan had vocal lessons whilst at the Peking Opera School in his childhood. He began producing records professionally in the 1980s and has gone on to become a successful singer in Hong Kong and Asia. 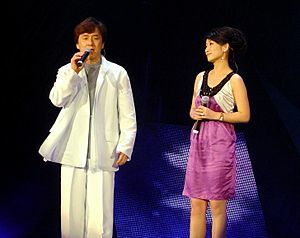 He has released 20 albums since 1984 and has performed vocals in Cantonese, Mandarin, Japanese, Taiwanese and English. He often sings the theme songs of his films, which play over the closing credits. 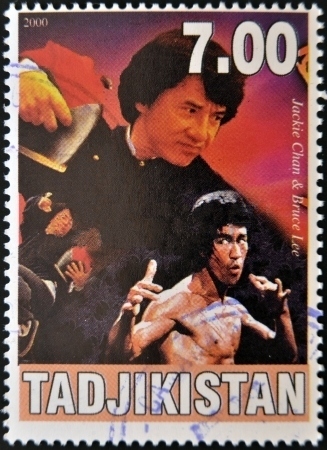 Chan's first musical recording was "Kung Fu Fighting Man", the theme song played over the closing credits of The Young Master (1980). Chan received his honorary Doctor of Social Science degree in 1996 from the Hong Kong Baptist University. In 2009, he received another honorary doctorate from the University of Cambodia, and has also been awarded an honorary professorship by the Savannah College of Art and Design in Hong Kong in 2008. Chan is currently a faculty member of the School of Hotel and Tourism Management at the Hong Kong Polytechnic University, where he teaches the subject of tourism management. As of 2015, he also serves as the Dean of the Jackie Chan Film and Television Academy under the Wuhan Institute of Design and Sciences. Chan speaks Cantonese, Mandarin, English, and American Sign Language and also speaks some German, Korean, Japanese, Spanish, and Thai. 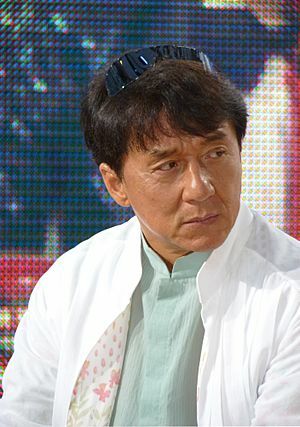 Chan has performed most of his own stunts throughout his film career, which are choreographed by the Jackie Chan Stunt Team. He has stated in interviews that the primary inspiration for his more comedic stunts were films such as The General, directed by and starring Buster Keaton who was also known to perform his own stunts. 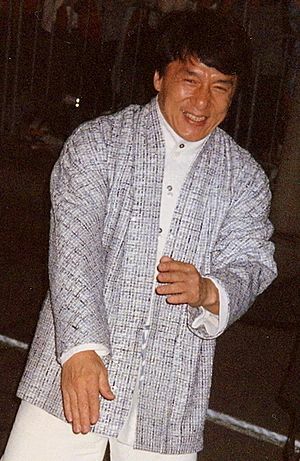 The team was established in 1983, and Chan has used them in all his subsequent films to make choreographing easier, given his understanding of each member's abilities. Chan and his team undertake many of the stunts performed by other characters in his films, shooting the scenes so that their faces are obscured. Chan holds the Guinness World Record for "Most Stunts by a Living Actor". 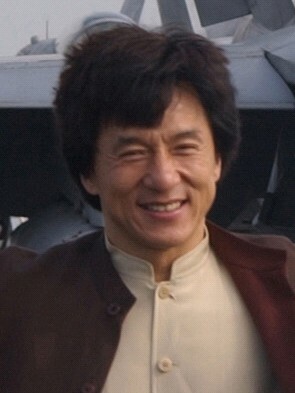 Chan has been injured frequently when attempting stunts; many of them have been shown as outtakes or as bloopers during the closing credits of his films. He came closest to death filming Armour of God when he fell from a tree and fractured his skull. Over the years, he has dislocated his pelvis and also broken numerous parts of his body, including his fingers, toes, nose, both cheekbones, hips, sternum, neck, ankle, and ribs. Chan created his screen persona as a response to the late Bruce Lee. Lee's characters were typically stern, morally upright heroes. In contrast, Chan plays well-meaning, slightly foolish regular men, often at the mercy of their friends, girlfriends, or families, who always triumph in the end despite the odds. Additionally, he has stated that he deliberately styles his movement to be the opposite of Lee's: where Lee held his arms wide, Chan holds his tight to the body; where Lee was loose and flowing, Chan is tight and choppy. Chan has received worldwide recognition for his acting and stunt work. His awards include the Innovator Award from the American Choreography Awards and a lifetime achievement award from the Taurus World Stunt Awards. He has stars on the Hollywood Walk of Fame and the Hong Kong Avenue of Stars. In addition, Chan has also been honoured by placing his hand and footprints at Grauman's Chinese Theatre. Chan was awarded the MBE in 1989 and the Silver Bauhinia Star (SBS) in 1999. Chan says he has always wanted to be a role model to children, and has remained popular with them due to his good-natured acting style. He has generally refused to play villains and has been very restrained in using swear words in his films. Chan's greatest regret in life is not having received a proper education, inspiring him to fund educational institutions around the world. He funded the construction of the Jackie Chan Science Centre at the Australian National University and the establishment of schools in poor regions of China. Jackie Chan has a sponsorship deal with Mitsubishi Motors that has resulted in the appearance of Mitsubishi cars in a number of his films. Furthermore, Mitsubishi launched a limited series of Evolution cars personally customised by Chan. A number of video games have featured Chan. Jackie Chan's Action Kung Fu was released in 1990. 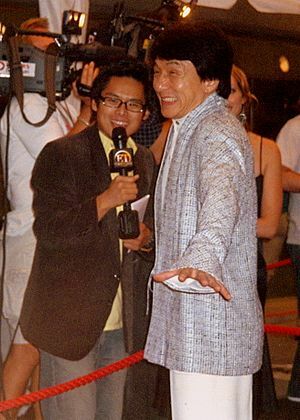 In 1995, Chan was featured in the arcade fighting game Jackie Chan The Kung-Fu Master. A series of Japanese games were released based on several of Chan's films. Construction has begun on a Jackie Chan museum in Shanghai. In November 2013, a statue of Chan was unveiled in front of what is now known as the JC Film Gallery, scheduled to open in the spring of 2014. 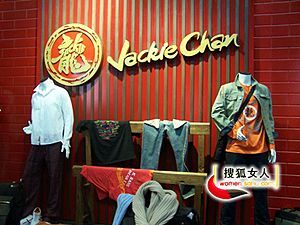 In 2004, Chan launched his own line of clothing, which bears a Chinese dragon logo and the English word "Jackie", or the initials "JC". Chan also has a number of other branded businesses. His sushi restaurant chain, Jackie's Kitchen, has outlets throughout Hong Kong, as well as seven in South Korea, with plans to open another in Las Vegas. 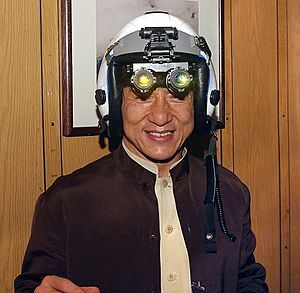 Jackie Chan's Cafe has outlets in Beijing, Singapore, and the Philippines. Other ventures include Jackie Chan Signature Club gyms (a partnership with California Fitness), and a line of chocolates, cookies and nutritional oatcakes. With each of his businesses, a percentage of the profits goes to various charities, including the Jackie Chan Charitable Foundation. Chan is a UNICEF Goodwill Ambassador, and has championed charitable works and causes. He has campaigned for conservation, against animal abuse and has promoted disaster relief efforts for floods in mainland China and the 2004 Indian Ocean tsunami. Chan pledged the donation of half his assets to charity upon his death. On 10 March 2008, Chan was the guest of honour for the launch, by Australian Prime Minister Kevin Rudd, of the Jackie Chan Science Centre at the John Curtin School of Medical Research of the Australian National University. Chan is also a supporter and ambassador of Save China's Tigers, which aims to save the endangered South China tiger through breeding and releasing them into the wild. Following the 2008 Sichuan earthquake, Chan donated RMB ¥10 million to help those in need. In addition, he is planning to make a film about the Chinese earthquake to raise money for survivors. In response to the 2011 Tōhoku earthquake and tsunami, Chan and fellow Hong Kong-based celebrities, including American rapper MC Jin, headlined a special three-hour charity concert on 1 April 2011 to help with Japan's disaster recovery effort. The 3-hour concert raised over $3.3 million. In January 2017, Chan donated $65,000 to help flood victims in Thailand. 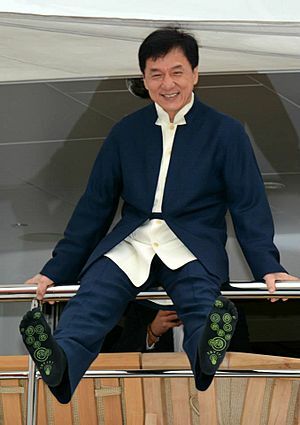 Chan founded the Jackie Chan Charitable Foundation in 1988, to offers scholarship and active help to Hong Kong's young people and provide aid to victims of natural disaster or illness. In 2005 Chan created the Dragon's Heart Foundation to help children and the elderly in remote areas of China by building schools, providing books, fees, and uniforms for children; the organisation expanded its reach to Europe in 2011. The foundation also provides for the elderly with donations of warm clothing, wheelchairs, and other items. 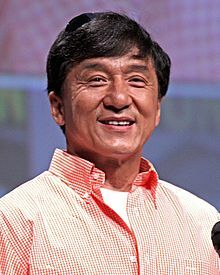 Jackie Chan Facts for Kids. Kiddle Encyclopedia.